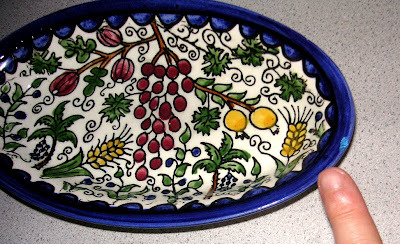 Seven summers ago, I chipped one of my favorite small serving dishes. Looking for a quick fix, I grabbed the blue nail polish I keep in the kitchen cabinet for marking pots, and filled in the chipped china edge. I figured, if it has been deemed safe enough to affix to ones body, then it's likely okay for use with food. After all, the nail polish manufacturers must be aware that some nervous people nibble their nails. Today, I realized this 'quick fix' is seven years old. Despite frequent use, it's still holding up nicely! I've only just discovered your blog and I love it already. I love cooking too and am always on the lookout for new recipes. That's GREAT! Please let me know how it works out.